Hard news or even soft news in the world of genealogy was certainly not one of my precepts for blogging but the Ancestry event in Toronto on 16 September begs comment. Ancestry.ca widely publicized the launch of its new database and the digital imaging of incoming ship passenger lists to Canada from 1865-1935. This is a stupendous achievement and deserved as much feedback as it could get from the media for which the launch event was primarily intended. I did count the Toronto Star, Toronto Sun, and Global Television among sites that had features at the end of the day or following. I’m sure I missed some. Perhaps less obvious was the quiet establishment of a Canadian office in Toronto. Or reference to the parent corporation called The Generations Network (TGN), based in Utah. Appropriately, the spotlight was on those Canadian passenger lists and the fact that maybe one third of living Canadians have ancestors appearing in them. The original documents are held by Library and Archives Canada (LAC), our national archives in Ottawa, a (necessary) partner in the project. Oddly, the reception was not held in Ottawa nor did LAC have a representative at the event. Originally we genealogists knew Ancestry.com as a subscription website where we could newly access wonderful things that had never been indexed for names before. From its American origins Ancestry has grown at a phenomenal rate to special sites for and in such countries as Canada (“dot ca”), the UK, Australia, Germany, and others—probably more even as I write. The rapid global growth of the TGN corporation indicates strong commercial recognition of the interest in family roots. A lot of competition and even more specialized websites/databases are developing to capture your interest. How do you “find” an ancestor in one of these databases? You key his name into the searchable database. Or how you think he spelled his name. Or how the person actually writing it down for a record spelled it. You take your chances on finding an ancestor who “fits” what you already know about him. If you don’t already know something about that ancestor, you could be up a gum tree as my Mom would say. If you don’t have some experience with genealogy, you might not know that there are six or ten or twenty different ways to spell his surname. For starters. What I’m saying is that the end result of this database creation is founded on names, especially surnames. The user often has an assumption that what was written on the original record has been exactly entered into the database. The original record may have its own inherent faults regarding spelling and identity—regular issues for family historians. The experienced among us recognize that human beings transcribe and decipher and do the data entry. We understand that it’s no easy job to read records that are almost illegible, poorly microfilmed or in unfamiliar context or language. Yes, even in Canada, imagine a francophone priest struggling to record the names for Highland Scots baptisms in Upper Canada or the Irish-born census-taker enumerating German-speaking immigrants. Local nuances can make a big difference for ancestor identity. Who are the people doing all this yeoman work for Ancestry? At the 16 September event, Josh Hanna, Ancestry's Senior Vice President for Europe, Canada and Australia, responded to a question by confirming that Ancestry outsources the reading, indexing, and data entry. Furthermore, he cited confidence in the 1,500 paleographers hired in Beijing for this purpose. Ancestry has an outstanding vision and we are the beneficiaries. Not to denigrate their accomplishments, but couldn’t important factors of the operation be moved closer to home? On 1 September 2008 I blogged about a spotted anomaly in the McFadyens on the 1716 list of Coll men. Now I can safely say (unless or until more information is uncovered) the sources in that discussion indicate it was Angus, and Angus only, among the surrendering men at Breacachadh Castle. My misunderstanding about Donald was due to first receiving an abbreviated transcription of the list. No debate attaches to Nicholas Maclean-Bristol’s writings. Let me note here that without the freely-offered assistance from the splendid volunteers who maintain the Coll and Mull genealogy websites, I would be nowhere. On the other hand, I am open to debate about whether I am more than two kilometers from nowhere. I’ve mentioned Donald the soldier before, my emigrating McFadyen ancestor from the Isle of Coll in the Inner Hebrides of Scotland. Donald joined the 2nd battalion of the 91st Regiment of Foot (Argyllshire and Sutherland Highlanders) in 1807 at the ripe and maximum age of 35. Britain was at war with Napoleon and revolutionary France. He signed up for a full seven-year term. Enlistment papers describe Donald as 5' 4" with a round face and brown hair, brown eyes and a brown complexion. While his battalion served at Stralaund and Ostend, Donald remained “at depot” in Ayr. He was discharged 24 December 1814. Years ago this information was sent to me by a very kind Gerald Hamilton-Edwards, the author of In Search of Army Ancestry. High on my to-do list now is obtaining copies of the War Office (WO 25/527) documents for myself. Why enlist then ... at his age? Donald and his wife Flory McLean already had three children by then and he was living as a labourer at Toraston on Coll. How to reconcile his having two children during his army period 1807-1814? More recently, my thoughts were revolving around the possibility that Donald could have had prior military service. Now I’m almost convinced. A second derivative source is providing me with exciting information. Another of my past correspondents, Nicholas Maclean-Bristol, produced his work of a lifetime in 2007: From Clan to Regiment: Six Hundred Years in the Hebrides, 1400-2000 (Sword and Pen Books, UK). The book is an outstanding work of scholarship, a history of Clan Maclean of Coll. The fortunes and follies of the Maclean estates directly affected my resident McFadyens. 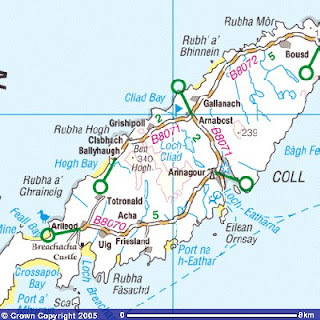 Maclean of Coll at various times held estates in the Isles of Coll, Mull, Rum, Muck and mainland Morvern. Living on Coll at Breacachadh Castle, Maclean-Bristol has had access to private Maclean papers. But that’s not all. His source citations reveal an incredible range of archival references. Coll parish registers only became somewhat “regular” in about 1776. The baptism of Donald c1772 is missing, as are baptisms of some of his children. Heretofore, the 1776 catechist’s list that named all the inhabitants of Coll was pretty well the end of the road for eighteenth century sources. In theory, Donald and his parents are on that list. My hypothesis regarding Donald’s parents is developing and will be tested against information and sources gleaned from this book—a future post, to be sure. ■ McFadyens were on Coll by the late 1500s, originally settling at Ardnish. It is said they had been dispossessed from Lochbuie in Mull, probably when their Maclean laird lost estates there. ■ At least one McFadyen line was traditionally part of the laird’s luchd-tighe—a group variously described as household men, a retinue, and/or a bodyguard. “Membership” in this coterie of military-trained supporters began with Maclean kin but also became hereditary in closely allied families. Usually they lived not far from the castle for defense purposes. ■ In 1679 Donald Maclean of Coll was defeated in an ongoing feud with the (Campbell) Earl of Argyll. Coll submitted a list of his garrison at Breacachadh Castle, headed by twenty or so of his luchd-tighe. This included two Mcphaidens: Duncan McDonald Vc Ian [sic] and his brother Dugall of Ardnish. It’s possible that two other brothers were McFadyen cousins: Iaian McNeill Vc Innes and his brother Ewen. Notice the patronymics, which I trust to the experts! ■ Following the suppression of the 1715 Jacobite Rebellion and the surrender of Maclean officers at Breacachadh, a list was made in 1716 of all males of military age on the island whether they had taken part in the rebellion or not, obliging them to give up their arms. Not many of the men on the list could be identified by a surname or patronymic. Some of the “certainly identifiable” castle defenders were of the same families as the 1679 list, according to Maclean-Bristol. Included in the luchd-tighe at this time was Angus MacFadyen, probably one of the joint tenants at Ardnish, close to Breacachadh. ■ Donald Mcphaden at “Breckachie.” That implies that Donald was the luchd-tighe man. Only four other McFadyen men were listed, likely living more distant from the castle: Angus Mcphaden at Feall, Hugh Roy Mcffaden, another Angus McPhadden and his son Angus. No locations are given for the last three. ■ However ... in From Clan to Regiment, Maclean-Bristol is saying (as above) Angus MacFadyen is the likely luchd-tighe member. Angus is further noted as giving up ‘a sword of Charles roy’s in Ardnish’ which led to the author’s conclusion about his place of residence. Here’s hoping that viewing more sources will clarify the above and help fill some gaps. The University of Guelph’s McLaughlin Library has arguably the largest collection of Scottish material outside of Scotland. And it’s only 50 miles away.